No doubt by now you’ve guessed I’m not much of a fan of ‘Euro’-style games. Dry victory point collection, moving meeples, area control: these things don’t really float my gaming boat. But funnily enough, wrap it all up in a gorgeous package with a strong, original theme, beautiful artwork, thoughtful graphic design, and some nice miniatures, and suddenly you have my attention. Such was the way with Scythe, successfully Kickstarted for over 1.8 million dollars by Jamey Stegmeier of Stonemaier Games. Given the author’s history I was confident it would be an enjoyable game, but what really drew me in were the evocative illustrations of Jakub Rozalski, which perfectly convey the alternative-1920s theme of farmers and industrial mechs, agriculture and war. It’s something wonderfully different after seeing the same old thematic ideas over and over, and I believe it was the illustrations that inspired Stegmeier to design the game. And thankfully, there’s a great game in the box, even for Eurogame-sceptics like me. There is a bit of the solitaire syndrome happening as you expend your little empire, but the choices are so engaging it doesn’t matter. I would have liked to have seen a little bit more emphasis on combat, as you can play entire games without mechs slogging it out, but the focus is on production and upgrading, and it does that beautifully. 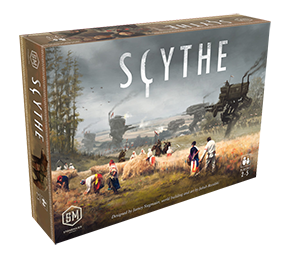 Scythe is already a big hit and Stonemaier Games, with its attention to detail and friendly customer service, deserves all the success they will get with this one. The game hardly needs a rules summary and reference, because the materials included in the game are so comprehensive. But here’s one for you anyway. Oh, and can I say, what an absolute pleasure to see a game with a single, bold, striking name. Ye, thank the Lord they avoided the temptation to call it something like “Scythe: Return of the Red Terror”. Or something execrable like Scythe: Children of the Motherland. Scythe – the only game played by the GRIM REAPER! Will you be developing a foam core for this one? Probably not, because there’s the retail version of the game, the Kickstarter version, and either of those versions plus the expansion. When there’s multiple configurations like that I think it’s best to leave people to their own devices! Will we get an update with the expansion content? Yes, I will get around to it soon. Does it need updating now that all 3 expansions are out? Ahh, Frederic, if only I had the money to buy every expansion for every one of the hundreds of games I own! 🙂 I haven’t yet got Fenris, but I may at some time in the future, in which case I’ll definitely update this sheet.